Sometimes I wonder what Kim Sears thinks. 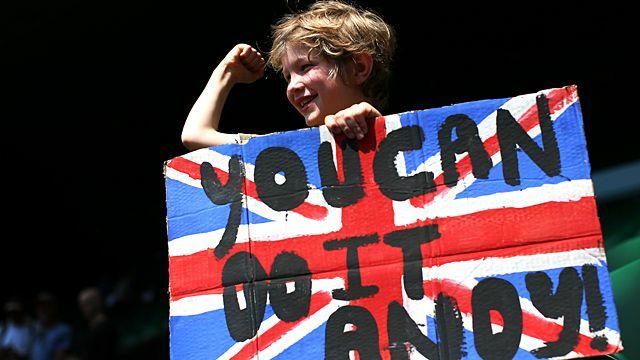 It’s hard to imagine being Andy Murray, playing for Great Britain’s first Wimbledon men’s singles title since 1936 — hard to imagine the pressure of that moment, the ambient crackle of having 60 million people look at you not just as an athlete to root for or against but as some kind of living test of national destiny. It’s hard to imagine because most of us, day to day, are not followed by solemn voices intoning that the hopes of a country are resting on our shoulders. Our empathy for anyone who is in that position is probably doomed to remain theoretical, like the laugh lines in a Jonathan Franzen novel, or Manhattan if you’ve never seen Manhattan. It’s easier to imagine being someone who cares about that person. After all, as fans, we’re already accustomed to a certain kind of highly charged powerlessness. 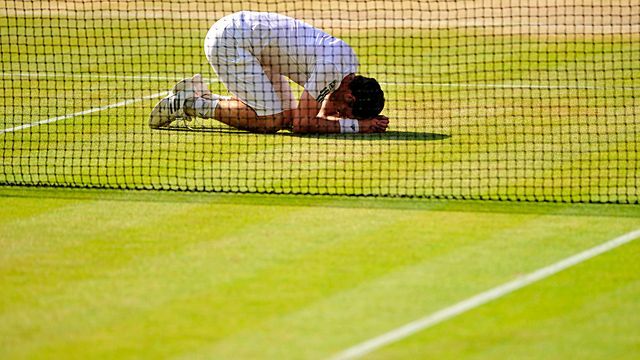 It’s only a medium-size leap between that feeling and putting yourself in Andy Murray’s box during Sunday’s Wimbledon final between Murray and Novak Djokovic. Being Kim Sears,1 say, or Judy Murray.2 Going through the agony of watching someone you love endure a terrific struggle, knowing the outcome will change their life, knowing you’re helpless to affect it. Trying to stay composed through the stomach-punch of Djokovic breaking your loved one’s serve in both the second and third sets. Figuring out what to do with your hands as the anticipation tightens. And then — finally — the flute riff of pure joy that shoots up your spine when Djokovic’s backhand ducks into the net and you realize he’s done it, Andy’s done it, he’s won Wimbledon, he’s lifted the curse, he’s made history. It wasn’t the best-played final the All England Club has ever seen. It wasn’t the longest or the most dramatic recent Grand Slam showdown, even between these two players. But for a three-set, 6-4, 7-5, 6-4 match — downright brisk by modern big-final standards — it was phenomenally tense. It was tense partly because this Wimbledon had already annihilated certainty and raised questions about the end of the world.3 But mostly it was tense because the matter of whether a British man would ever again win Britain’s home major had swelled, over nearly eight decades, into what felt like a permanently self-defeating national freak-out, a Rolex-sponsored Kobayashi Maru that would fatally Henmanize anyone who tried to conquer it. 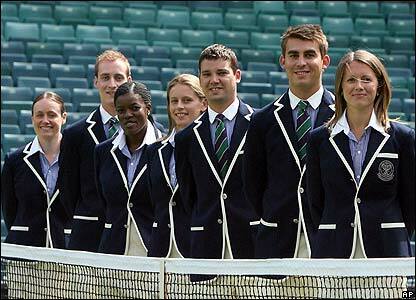 You knew Murray had the talent to win Wimbledon. You could see that Murray was out there winning Wimbledon. But somehow, until the very last shot, it seemed impossible that Murray would actually win Wimbledon over the collective queued-up panic reflex of the entire British Isles. (Imagine if the Chicago Cubs were one person.) Like many American tennis fans, I got caught up in the dare-we-hope angst-opera raging across the Atlantic and wound up rooting for Murray. For some reason, maybe because the cameramen cut to Murray’s box every six seconds, I started feeling like I had a tiny Ivan Lendl4 sitting in my head, and my brain kept cutting to him for reaction shots. 9:23 a.m. ET: Murray wins three break points on Djokovic’s first service game. Djokovic calmly crushes five straight points to take a 1-0 lead. 10:19 a.m.: Murray screams “Come on!” and wins the first set 6-4. Djokovic is looking extremely shaky out there. 10:43 a.m.: After a sequence of brutal baseline rallies, Djokovic breaks Murray for a 3-1 lead in the second set. He holds in the next service game and gives himself a tiny fist pump. The match is thisclose to being even. 11:01 a.m.: After another series of long defensive points, Djokovic double-faults to give the break back to Murray. Is Novak feeling the effects of his sensational win over Juan Martin del Potro in Friday’s five-hour semifinal? 11:31 a.m.: Looking haggard and hungry, like a wolf, or a wounded king, or some kind of combination wolf-king who has a thing for genteel racket sports, Andy Murray serves an ace to win the second set 7-5. He’s one set away from winning Wimbledon. 12:25 p.m.: We’re down to it now. Murray’s serving for Wimbledon. He races out to a 40-0 lead: triple championship point. The crowd is chanting. In London they’re hanging off lampposts. Queen Elizabeth just kicked a hole in the TV credenza. Djokovic, who’s been visibly shaken and playing second-rate tennis for at least the last hour and a half, somehow slips into this silent-killer fugue state and wins about three ridiculous points in a row. Back to deuce. The players keep trading the advantage. It’s excruciating. Finally, on his fourth championship point, Murray’s serve forces Djokovic into a lofted backhand return. It looks long, and ecstatic screams break out in the crowd, but it’s inside the line, the match isn’t over, so Murray, who must be half out of his mind at this point, wallops a forehand back to Djokovic’s left side and Djokovic dinks the backhand into the net. And that’s it. Andy Murray has won Wimbledon. He drops his racket and tears off his hat. If it seems like I’m making too much of this empathy-for-Murray’s-box angle, it’s because I’m simultaneously really happy for Murray and not at all sure how to jigsaw that happiness into the overwhelming British Britisher Britishest Britain narrative.5 I mean, I’m not saying that British people shouldn’t root for a champion from their own country … ish thing. But the human scale of Murray’s win does tend to get lost in the mania. And even the mania itself is weirder and more fascinating than anyone’s really giving it credit for, isn’t it? It’s a strange time for sports parochialism, the present. Some old assumptions about the relationship between sport and geography seem to be weakening, while others are intensifying, possibly in compensation. Britain’s most popular sports export, the English Premier League, is contested by mostly foreign players and has more fans outside England than inside it; there are people in Africa who care as passionately about Arsenal as does anyone in Islington.6 As recently as 10 or 15 years ago it was still possible to talk about national playing styles in tennis; today’s young players from Spain more or less resemble their counterparts from France or Serbia. The most famous Russian tennis player on earth, Maria Sharapova, has lived in Florida since she was 7. Andy Murray was born in Scotland, moved to a training academy in Barcelona as a teenager, and now splits his time between London and Miami. The idea that athletes are avatars of a place, and that the people from that place should support them on that basis, is as weak as it has ever been. On the other hand, the desire to draw on some basic connection between locality and sport hasn’t disappeared; it has just been vigorously muddled. I moved away from Oklahoma a long time before the Thunder even existed and I would vote for Kevin Durant for president. Wimbledon, with its strawberries and cream and its royal box and its rain delays, is the most phenotypically English sporting event in the world. It’s impossible to spend any time at the All England Club and not be struck by this. Everything about the tournament is self-consciously and conspicuously English; if it weren’t so obviously affectionate, the AELTC’s brand identity could be read as a sophisticated parody of Englishness at this point.7 So is it a coincidence that anxiety over the lack of a British champion at this event that’s so defined by place has intensified just as some of the old ties between sport and place started to loosen? (Or if they hadn’t started to loosen, would a Scottish tennis champion be quite as massive a sensation in the home counties?) I’m not sure, but it’s easy to read the frenzy over Murray in London on Sunday as a complicated reassertion of a complicated sporting identity that is complicatedly slipping away. And as I said, I’m not sure how to feel about any of this. I’m happy for Murray and his cool girlfriend and his fun mom and his human glower of a coach. I’m positive that Murray handled a totally unreasonable type and amount of pressure with better grace than anyone had a right to demand from him. (I mean, what with the whole “unchosen aspect of identity predetermining his career-defining and even life-defining challenge” thing he had going. Which is now just a “ha-ha, check out the extra $200 million in endorsement income my amazing feat just got me” thing.) It was the craziest Wimbledon I can remember, and I hope Murray’s win was a harbinger of even crazier outcomes in the future — say, an American man winning the U.S. Open. Since you’re reading this, I’m assuming you know that Kim Sears is Andy Murray’s girlfriend. If not, then hey there, stranger! Kim Sears is Andy Murray’s girlfriend. That’s Murray’s mom, curiously ill-informed stranger. Further evidence: The match was played on 7/7, the last British man won Wimbledon 77 years ago, the last British woman won Wimbledon in 1977, James Bond is DOUBLE oh SEVEN, and the Queen reportedly pounded 7.7 Red Bulls before passing out in the middle of the match. Murray’s coach. He played some tennis in his own day. Also, I like that Kim Sears paints dogs on commission. Did you know she does that? She’s great at it. OK, it’s not my thing personally, but objectively these are really good pet portraits. Sort of All Dogs Go to Heaven crossed with an understanding of how perspective works. I’m not kidding; very few people do anything as well as Kim Sears paints pets. See also: McGrady, Tracy, subheading China. Something that’s become even more pronounced since Ralph Lauren starting dressing the umpires in outfits that look like Ron Weasley’s dad’s idea of what rich Muggles wear to work.